NEW YORK — A listless late shift dragged on that night in the newsroom of The Associated Press and, across town, at The New York Times. Feet up on the AP city desk, an editor named Charles Crane read an H.G. Wells novel to while away the news-free night. "Telegraph instruments clicked desultorily," he said later, "and occasionally one could hear the heartbeat of the clocks." At the Times, the managing editor, Carr Van Anda, had returned from his usual late supper to an office where a forgettable story about a political feud was being readied for the front page. A copy boy dozed. In the midst of this somnolence at a little after midnight on April 15, 1912, no one knew that, 1,000 miles away, the "story of the century" was breaking — news that would change so many things, including news coverage itself. At that moment, off the coast of Newfoundland, the Titanic was two hours from sinking. For more than an hour, the great ocean liner had been sending out distress signals. "CQD, CQD," the coded Morse message repeated, then the now more familiar "SOS." The urgent calls were picked up by other ships — some of which turned toward the Titanic's reported location for rescue — and the signals reached onshore receiving stations of the relatively new Marconi wireless radio system. There, each scrap of detail was eagerly snatched up, passed on, then passed on again. In no time, the electrifying words reached New York. In the AP newsroom, Crane's yawn became a gasp when a colleague burst in from an outer office waving a wire message from Canada: "Reported Titanic struck iceberg." Instantly, editors started contacting coastal receiving stations to glean whatever they knew, phoned the Titanic's owners, cabled London for a list of passengers — who might now be doomed. "We put out a 'flash' and the bare report of the crash," Crane recalled years later in a recollection now kept in the AP Corporate Archive. That news story, stitching together the unthinkable bits of detail from wireless messages, went everywhere in seconds. At 10:25 o'clock tonight the White Star Line steamship Titanic called 'CQD' to the Marconi station here, and reported having struck an iceberg. The steamer said that immediate assistance was required." The Times presses were already running for an early edition. The managing editor fired off assignments and began composing a new front page, trying to make sense of the silence that, according to wire updates, had followed the repeated distress calls. Editors of many other papers would respond by "playing the story safe by printing the bulletins and writing stories that indicated that no great harm could come to the 'unsinkable' Titanic. Not Van Anda," wrote Meyer Berger in a history of the Times. "Cold reasoning told him she was gone. Paralyzing as the thought was, he acted on it." Last Wireless at 12:27 a.m. Blurred"
"In terms of news dissemination, the Titanic disaster can be seen as the beginning of what media guru Marshall McLuhan called the 'global village,' though he coined that term with 1960s satellite communication in mind," said communications professor Paul Heyer, author of "Titanic Century: Media, Myth and the Making of a Cultural Icon." Stories poured forth — careful and factual or speculative and wrong. "NO LIVES LOST," a London headline reassured in the confusing early coverage. In Paris, Le Figaro lamented "La Catastrophe du Titanic." Front pages in Australia echoed the tragedy for days. Reporters everywhere sought to localize the story — one paper even measuring the ship's immensity by imagining it berthed on the town's street grid. A Kentucky headline solemnly summed up: "Millionaire and Peasant, Shoulder to Shoulder, Go to Their Death..."
Errol Somay who oversaw a Library of Virginia exhibit of the universal coverage, said, "The thing that struck me was the news cycle — like 9/11: the coverage of the chaos of the event, then the human interest stories, then the fingerpointing ... We have to figure out whom to blame." The Titanic story established "a full-speed-ahead, all-hands-on-deck kind of coverage," as journalism educator Roy Peter Clark of the Poynter Institute put it, that has been repeated in countless disasters since. "There's evidence that that goes back to this event." The coverage showcased the benefits — and dangers — of seizing a new, instant-communication technology. It established standards and new standard-bearers. The story became a turning point for The New York Times. Its coverage would distinguish it among the city's 20 or so dailies, setting it on course to "secure claim to a position of preeminence ... among American newspapers that it would never relinquish," wrote Daniel Allen Butler in his history, "Unsinkable: The Full Story of RMS Titanic." Broadcast news, too, got a strong push with this story. David Sarnoff, a young Marconi operator, made a name for himself with days of nonstop updates from a storefront window in New York, drawing crowds so large the police had to keep order. It was the start of a pioneering radio career that saw Sarnoff become the long-serving head of the NBC network. The Titanic went down at a time when wireless, a technology that would become ubiquitous, was just taking hold — comparable to our adjustment today to Twitter and the like. As the stricken ship's messages were picked up, sometimes by amateurs with Marconi receivers, "you'd get these wireless operators that knew reporters and editors at newspapers, and they said, 'Here's what's going on,'" historian Butler said in an interview. "This was very much a social network — they were using dots and dashes rather than images over an LCD screen." And sometimes, the fragments of news, traveling lightning fast, got garbled. That apparently explains some first-day reports of the ship being towed to Halifax with everyone safe. Amid the wireless chatter crackling across the airwaves, someone asked about the Titanic passengers' safety — and the response somehow got confused with a message that another vessel was safely under tow. Butler traced the mix-up to "two fragments picked up by a wireless station in Massachusetts." Balancing speed with accuracy is, of course, a reporting lesson that persists, as do others that unfolded with the Titanic coverage — about finagling eyewitness accounts, about debunking dubious official claims, about championing the release of information. 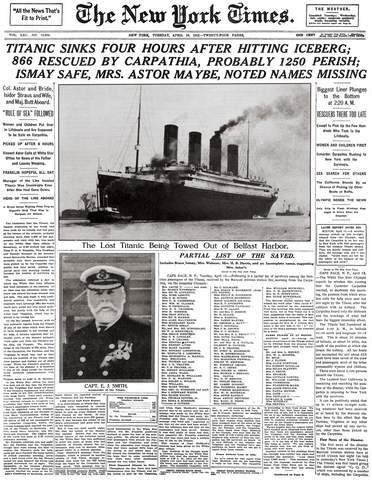 This news story can be divided into three parts, answering three basic questions: At first, reporters simply tried to clarify the "what" — what had happened 400 miles off the Newfoundland coast; when survivors finally arrived in New York on the rescue ship Carpathia, the "how" could be gathered from eyewitnesses; and finally, as official and journalistic investigations examined the disaster, the public would start to learn the "why" that has enthralled us for 100 years. The Titanic's owners, the White Star Line, contributed to the early, contradictory reporting with their silence or misleading statements. Rumors spread, along with hopeful speculation. Finally, an emotional White Star executive, Phillip A.S. Franklin, addressed the press. He later described the scene: "I got off the first line and a half, where it said, 'The Titanic sank at 2 o'clock a.m.,' and there was not a reporter left in the room — they were so anxious to get out to telephone the news." Another information blackout followed: The Carpathia relayed lists of the survivors it had picked up, but didn't respond to the clamor for other news. It turned out that a Marconi company official had advised the ship's telegraph operators not to divulge anything; the news would command greater value on arrival. In fact, a deal between Marconi and the Times for exclusive interviews of the radiomen had been worked out — a news-withholding arrangement that Giuseppe Marconi himself later promised not to repeat. Editors knew the story would reach a crescendo with the Carpathia's arrival in New York harbor, and they prepared as if for war. "The Associated Press established headquarters in a hotel facing the dock where the Carpathia landed, with special telegraph and telephone lines reaching the general office at 195 Broadway," a brief history in AP's corporate archive reported. Supplemental staffers arrived from Washington and Albany, and the news service's general manager, Melville Stone, spent the night at the emergency offices. Other news organizations similarly girded. The Times booked an entire floor of the nearby Strand Hotel, and laid plans for 16 reporters to meet the ship. Van Anda had an ace up his sleeve: He sent reporter Jim Speers to meet Marconi, who was dining with a company official, John Bottomley. The Marconi men would be among the few allowed to board the Carpathia before passengers disembarked. Reporters were strictly forbidden. When Marconi, Bottomley and Speers arrived together at the Carpathia's gangway, a policeman barked, "Mr. Marconi can come, and his manager." But who was the manager? Without hesitating, reporter Speers bounded aboard with Marconi. He sought out Titanic radioman Harold Bride, and interviewed him for a riveting front page story. "'Men, you've done your full duty ... I release you ... Every man for himself,'" Bride quoted the Titanic's captain as telling him and his fellow radio operator Jack Phillips, as the end neared. "I looked out. The boat deck was awash. Phillips clung on sending and sending (distress calls). He clung on for about 10 minutes, or maybe 15 minutes, after the captain had released him. The water was then coming into our cabin." On page 3 of that edition of the Times — and on April 19 front pages from San Francisco to Boston — another harrowing eyewitness account appeared. Minute-by-minute, it detailed the unfolding disaster, including a view from the lifeboats just after the Titanic disappeared: "There fell on the ear the most appalling cries that human being ever listened to — the cries of hundreds of our fellow beings struggling in the icy cold water, crying for help with a cry that we knew could not be answered." Who wrote this widely disseminated story? It was a rescued passenger named Lawrence Beesley, an English schoolteacher, who later explained: "It was written in odd corners of the deck and saloon of the Carpathia, and fell, it seemed very happily, into the hands of the one reporter who could best deal with it, The Associated Press." So another forbidden reporter got on the Carpathia? This was Richard Lee, an AP staffer whose unsung duty was to be a sort of journalistic sentry, meeting incoming ships at New York harbor's "quarantine" before they docked. "The AP office had forgotten him," according to internal reports in the news service's corporate archive. But somehow Lee "boarded the Carpathia down the bay and came up with her to the dock, met Mr. Beasley (Beesley's byline was misspelled) and secured his story." Yet another journalist evaded the police embargo, though his story involved luck as well as pluck. Carlos F. Hurd of the St. Louis Post-Dispatch happened to be aboard the Carpathia for a vacation with his wife when it rescued the Titanic survivors. En route back to New York, he interviewed many of them, and then, defying the crew's orders, hurled his copy, which he'd tied to a buoy, onto a tug sent alongside in the Hudson River by the paper's fiercely competitive owner, Joseph Pulitzer. Although Titanic news would remain on many front pages for weeks, it became a different story now. There was coverage of the return of the dead. From Halifax, Nova Scotia, AP's Frank Elser described the "rough coffins" stacked at the stern of a recovery ship. Newspapers closely followed a U.S. Senate investigation, at which, among many others, some top editors were called to testify about how well or poorly the public had been informed. AP's Stone spoke against withholding information from the public in a major disaster, calling it a "mistake to make merchandise out of that." When the Senate inquiry turned to whether aid might have reached the Titanic sooner, it got an explosive assist from a news story. There were suggestions that the ship Californian, which had stopped for the night because of the ice danger, might have been close enough to make a rescue; its captain waved the notion away. But a crewmember, Ernest Gill, told The Boston American a devastating version of events: The Californian, its wireless turned off for the night, saw the Titanic's repeated distress flares, and the captain was informed but took no action before going back to sleep. In the story, Gill estimated the ships were just 10 miles apart. Once again, journalism became history's proverbial first draft. On seeing the story, the committee summoned Gill, and his testimony added another colossal what-if to the Titanic narrative that has endured for a century in poems, songs, plays, movies, right down to TV's "Downton Abbey" today. "It was the unthinkable tragedy," said Heyer, the communications professor. "Every factor that played into the Titanic becoming a myth played into the news coverage."